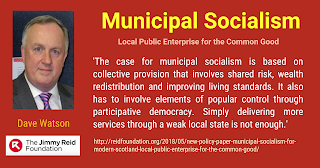 Municipal socialism is the basis for delivering a wide range of local services in local government across the world. Today, I was in the Scottish Parliament introducing my latest paper for the Jimmy Reid Foundation 'Municipal Socialism for a Modern Scotland'. I am grateful to Scottish Labour Party Leader, Richard Leonard MSP, for his introduction. The paper sets out the historical context, which runs from the 19th century Liberals who addressed the appalling conditions in our cities by introducing municipal water, gas and other utilities. 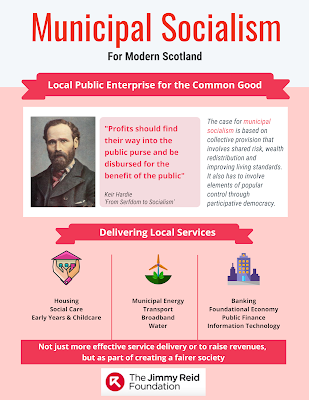 Keir Hardie devoted a chapter to municipal socialism in his book 'From Serfdom to Socialism'. The cause was taken up in the USA by the 'sewer socialists' whose efforts can be seen even today in the wide range of public services delivered by public authorities in the USA. Scottish Local Government today has taken the brunt of austerity and services have been centralised. The case for municipal socialism is based on a very different approach. It recognises the benefits of collective provision, not just because it is a more effective way of delivering services, or even for the revenues it would generate, but as a key element of a strategy to reduce inequality - Scotland's main 21st century challenge. The paper outlines eleven services that would benefit from municipal socialism. It is not an exhaustive list, but it shows the range of opportunities available to councils that are willing to grasp the challenge. Some are familiar services like housing, social care and early years provision. Others like energy, transport, broadband and water are commonly delivered by local government across the world, but rarely in Scotland. The final group of services are aimed at strengthening the local economy; including banking, IT, new forms of public finance and supporting the foundational economy. Just transferring or creating new services to a weak local state is not enough. It requires new forms of participative democracy that fully engage citizens in local government. Taking this agenda forward requires bold leadership from councils. I have argued elsewhere that local government in Scotland must move away from being the passive administrators of austerity, to become the political leadership of their communities. I hope this paper provides a template for radical councils to grasp the opportunities that municipal socialism offers. Delivering better health and care integration is a challenge in all parts of the U.K. and internationally. 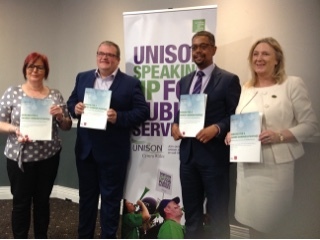 We should try and learn from experiences elsewhere, and I was in Cardiff today contributing to the Cymru/Wales UNISON seminar on the issue. Wales faces similar challenges to Scotland - austerity and Brexit. The Welsh health minister told the conference that reform should be about better ways of delivering services, not just about saving money. They have had a parliamentary review of care integration that has made recommendations for going forward and a new government plan will be published soon. The minister was not convinced that big structural change was the way forward, but he was in favour of better partnership working between health and local government. There are good examples of integrated system change locally that can be scaled up nationally. He was strong on the need to engage staff in finding solutions - making it a formal part of the system. As he put it; "Motivated staff are much more likely to do a better job." Wales has similar problems to Scotland with fragmented domiciliary and residential care, many of which are struggling. The minister said better commissioning and standards had to be part of the solution. He recognised the need to increase funding and they are looking a levy to specifically fund the increasing cost. Something that hasn't really been part of the debate in Scotland. The research report launched at today's conference highlights a very complex picture of care integration in Wales. Words like 'partnership', 'integration' and 'seamless' service are used, and abused, with means often confused with ends. As in Scotland, the driver is collaboration not competition, but that has its challenges around trust and power. Previous reports have been critical of progress and they have similar problems with short term funding initiatives rather than increasing core funding. The core of the report is three case studies on integration. The Bridgend approach shows real improvements in outcomes like unscheduled care and long term placements. Anticipatory care is key to preventing inappropriate admissions and building trusted relationships between staff. Monnow Vale in Monmouthshire is a good example of how locality based health and social care hubs can work. Staff are co-located, they talk to each other and staff are empowered to find solutions that work locally. This is an approach that we should do much more of in Scotland as recommended by the Social Care Commission. It resulted in a more welcoming approach for users and greater continuity of care - creating a relationship with the carers. Trade union involvement in designing services and getting pay and conditions right was important in building trust in working together and redesigning home care. Ynys Mon (Anglesey) case study is an example of enhanced dementia service using a residential home as a base to integrate services with community health staff. It was obvious that staff had a real sense of ownership, being engaged in service design from the outset. The parliamentary review, independent of government with a cross-party reference group, pulls some of this together. They recognised the case for change is compelling, but it hasn't always compelled action. Amongst ten key recommendations, it makes the case for co-location of staff, a focus on outcomes (what they call the Quadruple Aim) and a recognition that staff are a key element in service delivery. It is not about restructuring, it's about effective implementation of a seamless service across all services. In my presentation I set out the lessons from Scotland's experience in health and care integration. Many different models have been tried, but it is still work in progress. Demographic change places additional costs on an already underfunded service, particularly in the local government half of the process. In social care we have a hugely fragmented service that makes workforce planning very difficult. And of course there is always Brexit! We do have decent procurement frameworks, including the living wage, but councils put insufficient weighting on workforce matters and do very little monitoring of the quality of service delivery. My colleague from London, outlined developments in England. There is very little action on a national basis in England and just a few local initiatives. In essence it's a mess. Finally, workforce regulation in Wales is following the Scottish model, with the phased regulation of domiciliary care staff. They have similar challenges in terms of recruitment and retention of social care staff. 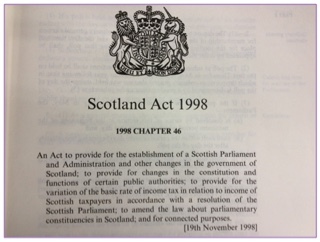 Scotland is probably a bit ahead of Wales in terms of legislation and structure. However, the challenges are very similar and they do have some impressive examples of best practice, highlighted in the report. On that basis the research report published today is well worth a read. No one has got integration right yet, so we can all learn from experience elsewhere. 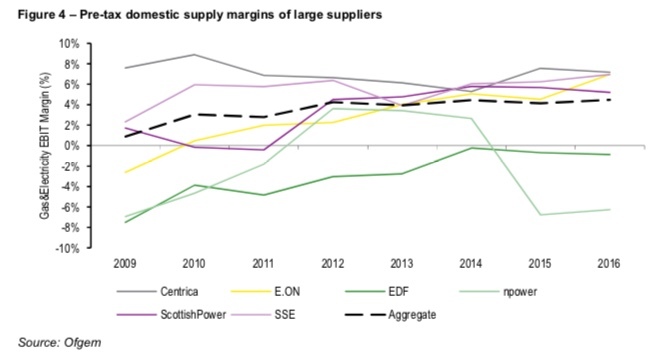 The creation of a Scottish public sector energy company is very welcome initiative, but the suggested model lacks ambition and is unlikely to tackle the failed energy market. On 10 October last year the First Minister announced the Scottish Government's intention to set up an Energy Co. by the end of this Parliament in 2021. They commissioned consultants Ernst and Young LLP to prepare a Strategic Outline Case, which has recently been published. 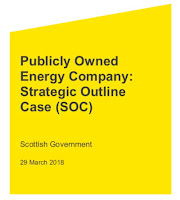 The strategic case for Energy Co. is based on the significant challenges that exist in the Scottish energy market, including high electricity prices, a lack of consumer switching and significant levels of fuel poverty. The strategic case demonstrates that the creation of the Energy Co. has the potential to successfully address some of these problems. Their analysis indicates that the pre-tax profit margins made in the retail energy market are limited. This may present challenges to the Energy Co. in a highly complex and competitive market. However, if the Energy Co. is able to provide competitive pricing, together with positive and trusted branding as a public provider, it would be well positioned to develop a sufficient customer base. Particularly with disengaged customers that would otherwise have remained on an uncompetitive tariff. Energy Co. could also encourage energy efficiency more successfully than existing suppliers. Promoting energy efficiency as a way of reducing energy consumption, as opposed to reducing energy costs, is another means of tackling fuel poverty. Energy Co. also has the potential to support economic growth by supporting local energy generation and efficiency, using the lower cost of capital available to government and local authorities. The paper suggests a number of delivery models ranging from using an existing supplier, a Government company or a hybrid option involving municipal energy companies. The operating model could be a simple 'White Label' branding of an existing supplier, to a full capability licensed company. The former would have low start up costs and risk, while the latter is more costly in year one, but has greater flexibility and operating scope. In fairness to the consultants it may have been the brief, but the report is very modest in scope. There are also a number of uncertainties, not least the impact of Brexit and the effect that will have on the current market arrangements. Energy regulation is reserved to Westminster and while the Tories are taking baby steps in reforming the market, Labour is developing much more radical options. Setting up another retail option in a crowded market is a very limited model. As with municipal energy companies, they need to be in generation and energy efficiency as well. I would also argue that distribution networks could be more local on European models, but that option isn't currently available. The 'Topco' model in the paper has some merits in developing common billing and other systems, but we should be wary of over centralisation, which would negate the innovation and localism of municipal energy. Having energy efficiency as a National Infrastructure Priority hasn't added much so far, although the Scottish Government has just published a new Route Map to an Energy Efficient Scotland. In addition, one of the brand selling points of Energy Co. ought to be its low carbon offer. Sadly the paper is pretty light on this. The same can be said of how it deals with heat, just as important going forward as electricity. Developing a new state Energy Co. within the constraints of the current energy market and EU restrictions will always be challenging. 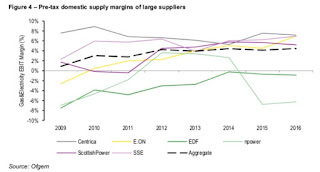 We need a much more radical approach to energy reform including public ownership of the transmission and distribution system, public investment in new forms of generation linked to a new industrial strategy, as well as public energy supply companies. 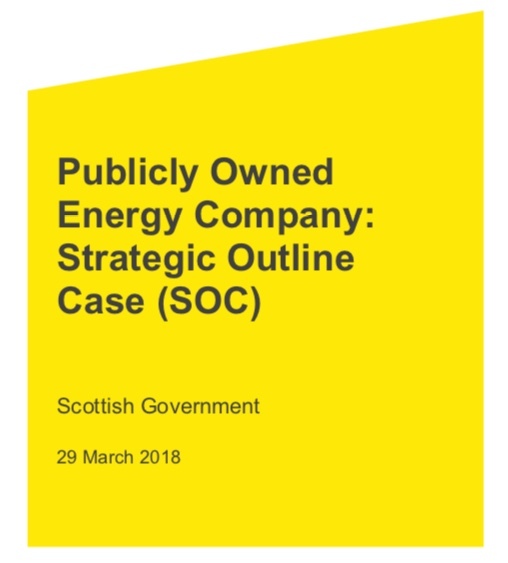 The risk in this Strategic Outline Case is that we end up with a modest dabble in the market that fails to address the real problems facing Scotland's energy sector.